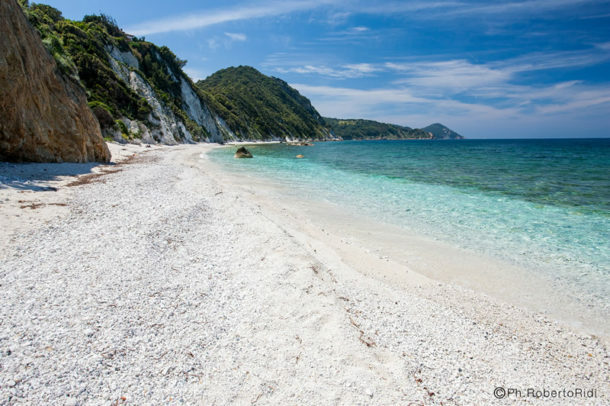 Acquaviva: a small pure white pebble beach, near Enfola and Viticcio, in the area of Portoferraio. Bagnaia: Bagnaia is also near Portoferraio; the sea bed is gravelly and the nature wild, but there are swimming establishments and facilities of all sorts to be found here. A departure point for boating and canoeing excursions. Places that are difficult to access except by sea can also be reached from here. Biodola: A long golden beach with a backdrop of Mediterranean forest 8 km from Portoferraio and a renowned and frequented tourist location, with numerous restaurants, hotels and locales facing directly on to the sea. 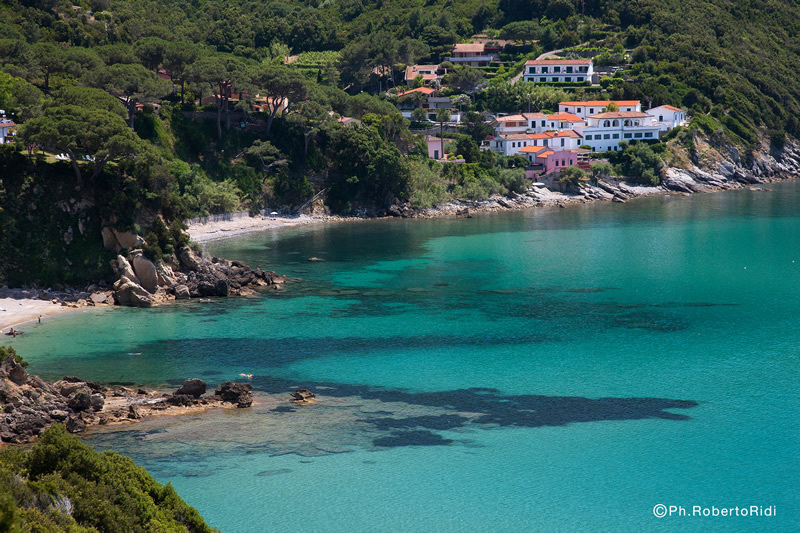 Cala dei Frati: A small white pebble beach, only accessible by sea. 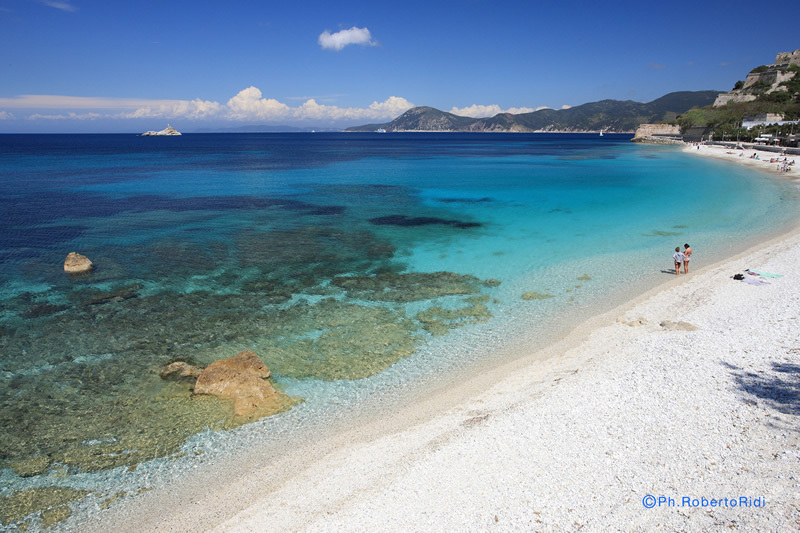 The ideal location for snorkelers, with its crystalline water and numerous varieties of fish (Portoferraio). 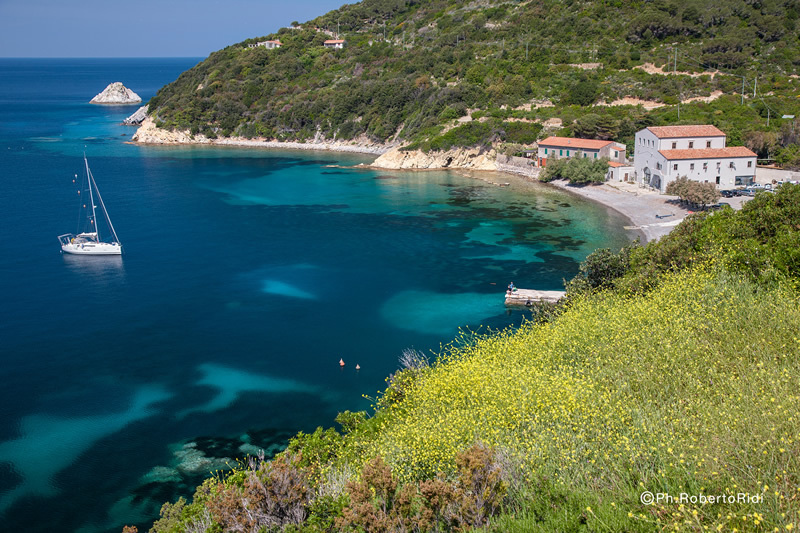 Capo Bianco: Another enchanting location, in this case also accessible by land, this is a beach os white pebbles and crystalline water, close to the centre of Portoferraio. 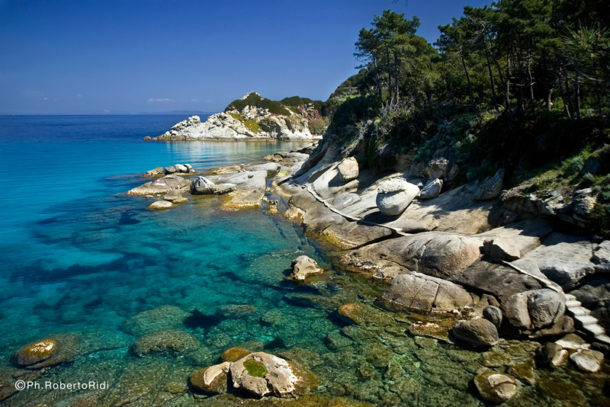 Enfola: Renowned for its old tuna-fishing community and now the centre of the Tuscan Archipelago National Park. 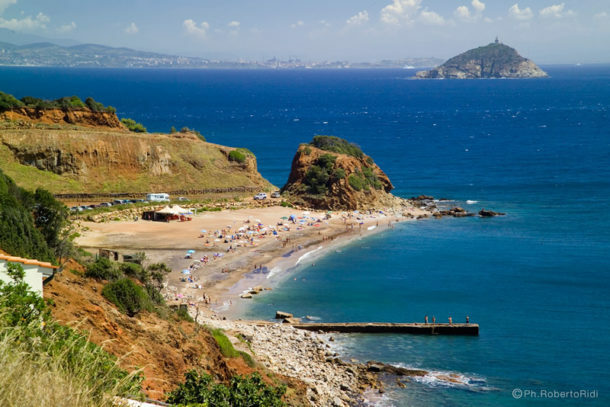 The peninsula of Enfola is characterised by a this isthmus of land creating two of the three beaches. One beach faces north and the other south. The third is accessible from the second bend in the gravel road leading to the promontory; the beaches are pebbled and there are facilities available (Portoferraio). Forno: A small and peaceful sandy beach with facilities, facing on to the Gulf of Biodola. La Fenicia: A large beach covered by stones brought in by the sea in MArciana Marina, with numerous facilities and access for the disabled. La Paolina: Renowned because it is said that this was Napoleon’s sister’s favourite place to sunbathe and swim away from the eyes of the indiscreet; the small islet of Paolina is opposite the beach and can be easily reached by swimming. Composed of a mixture of sand and gravel, it is named after Napoleon’s sister (Marciana). Le Ghiaie: Le Ghiaie is one of the most beautiful beaches at Portoferraio, composed of small and comfortable deposited white pebbles. The area is under biological protection and is ideal for scuba diving, as the biological protection area extends from Capo Bianco to Scoglietto. Le Sprizze: Le Sprizze is a pebbled beach right next to a pine forest, composed of dark stones, on the road from Procchio to Marciana Marina. Le Viste: Close to the historical centre of Portoferraio with the old Medici walls towering over it, a mixture of sand and pebbles and only accessible on foot, close to the Villa dei Mulini. Nisportino: This is the best beach for those who want to get away from city life and have a peaceful and relaxing holiday. The beach is well protected from the wind and suited to children, with its shallow waters and tourist facilities available (Rio Elba). Padulella: A white pebbled beach, near Le Ghiaie and Capo Bianco, with excellent facilities and clean water (Portoferraio). Procchio: This is one of the largest and easily accessible sandy beaches on Elba, providing excellent facilities and with a particular archaeological feature of its own: about one hundred metres from the shore on a sea bed only three metres is the wreck of a loaded Roman vessel which sank there (Marciana). 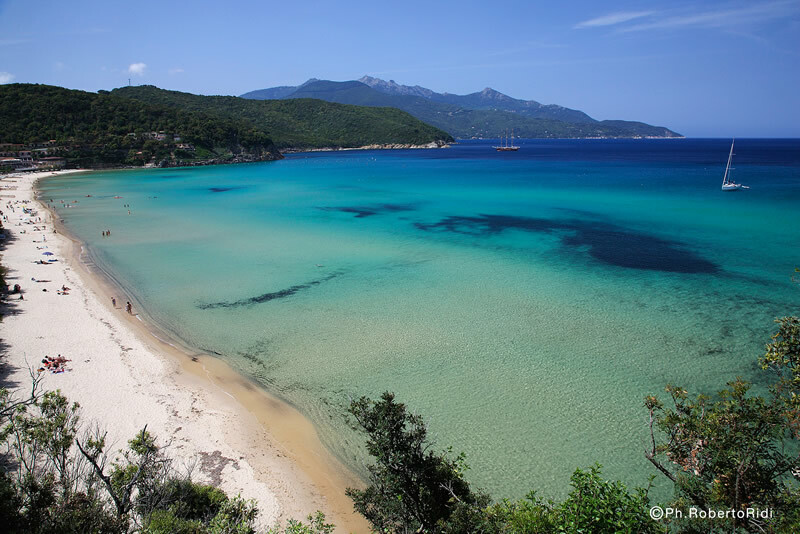 Redinoce: A pebbled beach located between Procchio and Marciana Marina, with good facilities, composed of a mixture of gravel and sand and a beautiful view over the Gulf of Procchio and Enfola. Sansone: One of the best views over the northern coast is from this beautiful white pebbled beach, with a beautiful sea bed (Portoferraio). Scaglieri: This beach, with its shallow water and sandy sea bed, is right next to the beach at Biodola and offers good facilities and beautiful sunsets over the island of Capraia (Portoferraio). 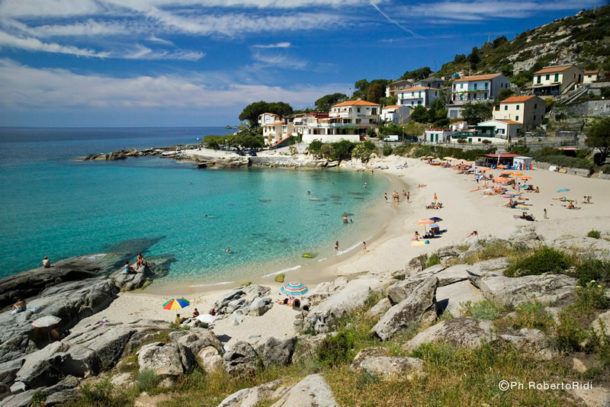 Viticcio: In an enchanting setting, the beaches at Viticcio do not offer any facilities, but are an ideal location for those who want to get away from the masses and enjoy some peace and relaxation at the seaside. 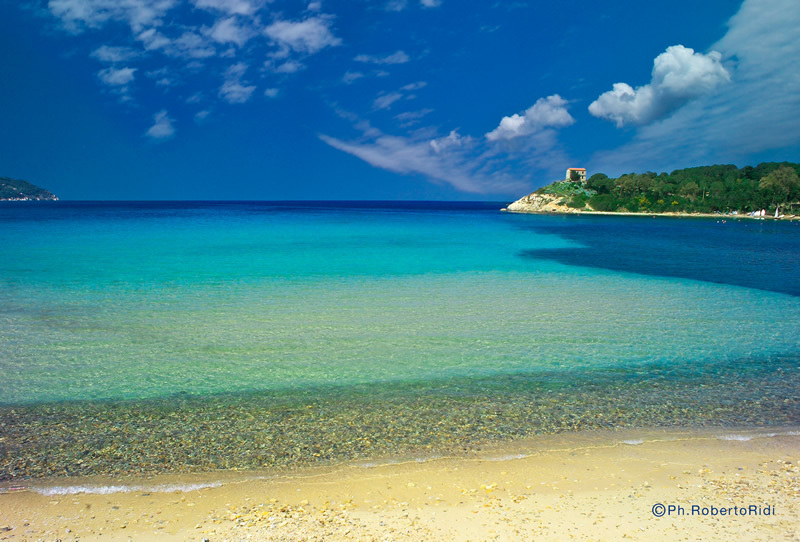 The beaches are mainly rocky and in small inlets (Portoferraio).